Multiple Chemical Sensitivity is a chronic medical condition characterized by symptoms that the affected person attributes to exposure to low levels of chemicals. Commonly suspected substances include smoke, pesticides, plastics, synthetic fabrics, scented products, petroleum products and paints. Symptoms may be vague and non-specific, such as nausea, fatigue, and headaches. Multiple Chemical Sensitivity(MCS) or Idiopathic Environmental Intolerance (IEI) is a chronic medical condition characterized by symptoms that the affected person attributes to exposure to low levels of chemicals. Commonly suspected substances include smoke, pesticides, plastics, synthetic fabrics, scented products, petroleum products and paints. Symptoms may be vague and non-specific, such as nausea, fatigue and headaches but also commonly include inflammation of skin, joints, gastrointestinal tract and airways. 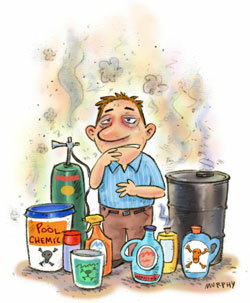 Multiple chemical sensitivity (MCS) can be considered an environmental illness (see the site on The Environmental Illness Resource at http://www.ei-resource.org/), term generally used to describe a number of mild to severe health responses to toxins and chemical products. The first description of a similar disease was given by Edgar Allan Poe in 1839 (Symptoms in the stories of E.A. 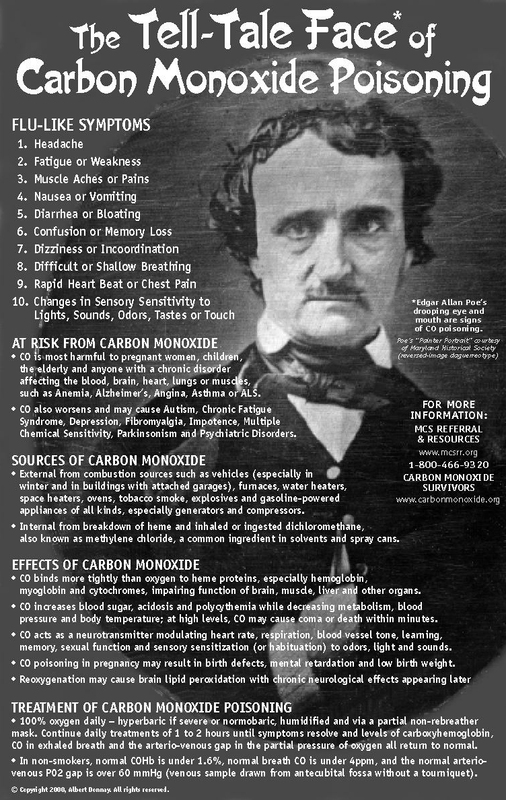 Poe; The tell-tale face of CO poisoning). The American author was, in fact, repeatedly poisoned by exposure to carbon monoxide (CO) from illuminating gas, which was made from coal and contained extremely high levels of CO. It was then medically definited as a symptom fo neurasthenia in 1869, and rediscovered as allergic toxemia in 1945. In 1987, after been proposed not as symptom but as a distinct desease, was redefined in MCS. Finally in the 1990s it was associated with chronic fatigue syndrome, fibromyalgia, and Gulf War syndrome as a syndrome with no certain or unkonwn etiology. In fact, MCS is not recognized as an organic, chemical-caused illness by the American Medical Association and some other Us based organisations because of the lack of scientific evidence that supports a cause-and-effect relationship between exposure to low levels of chemicals and the symptoms. According to avaiable informations about American population (Prevalence of multiple chemical sensitivities: a population-based study in the southeastern United States, 2004) 12.6% of Americans have reported an unusual hypersensitivity to common chemical products such as perfumes, fresh paint, pesticides, and other petrochemical-based substances, and 2.5% reported they had been medically diagnosed with MCS. Additionally, 31.1% of those sampled reported adverse reactions to fragranced products, and 17.6% experienced breathing difficulties and other health problems when exposed to air fresheners. Although chemical hypersensitivity was more common in women1 it is experienced by both men and women of a variety of ages2 and educational levels. A population-based, cross-sectional epidemiological study (MCS. 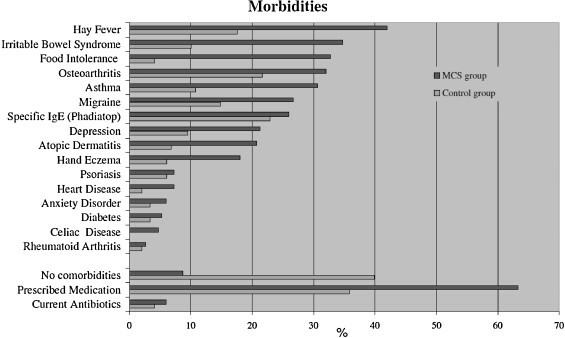 Symptom Prevalence and Risk Factors in a Military Population, 2000) involving American veterans of the Gulf War and non-Gulf War veterans concluded that the prevalence of MCS-type symptoms in Gulf War veterans was somewhat higher than in the other. A more recent study (Prevalence and interannual changes in multiple chemical sensitivity in Japanese workers, 2014) has shown that MCS exists among Japanese workers and that prevalence rate has been higher in 2011 than in 2003. MCS is characterised by recurrent, vague and aspecific symptoms referrable to multiple organ systems (Clinical features of multiple chemical sensitivity, 1997). They occur in response to demonstrable exposure to chemical compounds at doses far below those known to cause harmful effects in the general population. No one available test of organ system function can explain the symptoms. The wide heterogeneity of symptoms between individual people make it difficult to define a typical symptoms pattern for MCS. It is also reported an acute sense of smell (hyperosmia) and sensitivity to natural plant fragrance and natural pine terpenes (Odor processing in multiple chemical sensitivity, 2006; Multiple chemical sensitivity worsens quality of life and cognitive and sensorial features of sense of smell, 2014). But also a lot of other toxic agents: agricultural chemicals, gasoline (or diesel fuel), petroleum-based products (e.g. asphalt), formaldehyde, glues, varnishes, nail polishes, paints, solvents, paint thinners, volatile organic compounds (VOCs), lotion, aftershave lotions, skin care products, air fresheners, deodorizers and scented candles, shampoos, hairsprays and hair care products, dishwashing liquid and dishwasher detergent, marking pens (e.g. highlighters). testing patients response to the random introduction of chemicals that they have self-identified as relevant (e.g. scented soaps, detergents, etc.). MCS is frequently misdiagnosed as asthma, allergic conditions and mast cell activation diseases such as mastocytosis where symptoms such as brain fog and headaches can be triggered by chemicals or inhalants. So patients are frequently referred to respiratory and allergy specialists. Most often the syndrome is regarded as a phsychiatric disorder (above all anxiety disorders) or diagnosed with somatoform disorder and mood disorder. 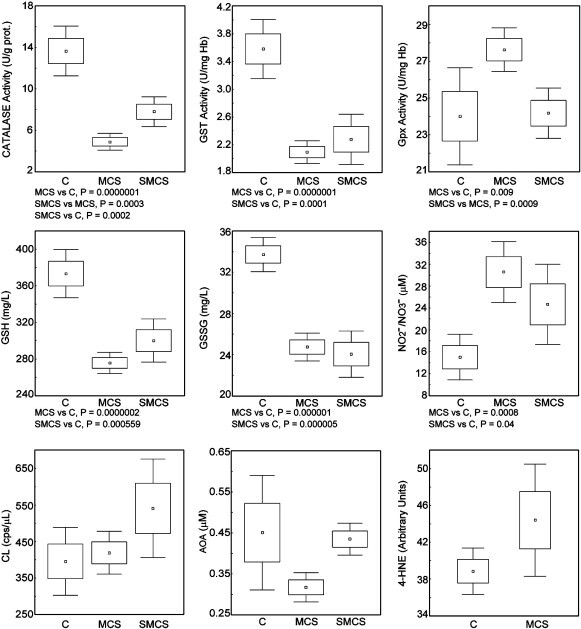 MCS is a poorly understood condition and there is no univoque theory about its pathogenesis. However many hypothesis have been proposed. As a consequence of these polymorfism, people with MCS may show genetically determined impairments of detoxification enzymes, CNS sensitization (Multiple chemical sensitivity: potential role for neural sensitization, 1999) and an elevation of nitric oxide/peroxynitrite (Elevated nitric oxide/peroxynitrite theory of multiple chemical sensitivity, 2003). Latest theories regarding MSC pathogenesis (A cross-sectional study of self-reported chemical-related sensitivity is associated with gene variants of drug-metabolizing enzymes, 2007 ; Biological definition of multiple chemical sensitivity, 2010) emphasize decreased levels of reduced and oxidized glutathione (GSH/GSSG), as well as of glutathione-metabolizing enzymes activities. The genetic variants analyzed regard glutathione S-transferases(GST). GST is a family of conjugating enzymes playing a key role in the biotransformation of organic xenobiotics, in the metabolism of endogenous electrophiles (e.g. HNE) and in the deactivation of reactive oxygen species. The GST isozyme polymorphisms is considered implicated in the risk of environment associated tumors and other environment related human pathologies (such as MCS, systemic lupus erythematosus and vitiligo and MCS) as well as cellular processes of inflammation and degenerative diseases). Individuals with self-reported chemical-related sensitivity were more frequent carriers of genetic variants (especially homozigous deletions) of GSTM1, GSTT1, GSTP1 and NAT2. In all of these mechanisms, excessive ROS are involved. So in MCS patients exist serious and multiple dysfunctions of chemical defensive system. They can depend on genetic defects and modifications of metabolizing/antioxidant enzyme expression or activity mediated by redox active agents such as NO and inflammatory cytokines (e.g. IFN-γ and IL-10). The polymorphism also regards genes encoding the receptors and transcriptional factors regulating metabolizing enzymes. Dysfunction or depletion of GSH, GST and catalase leads to severe oxidative stress due to an insufficient elimination of oxidation metabolites. Excessive amount of hydrogen peroxide and other free radical initiates a non-enzymatic reaction of lipid peroxidation resulting in the decomposition of PUFA to form a broad array of aldehydes such as malondialdehyde (MDA) and 4-hydroxy-2-nonenal (4-HNE). These aldeydes easily react with proteins and DNA5, affecting enzyme gene expression, enzymatic activity, and forming autoantigens. This chain is confirmed by significantly low content of PUFA founded in the erythrocyte membrane and increased levels of HNE-protein levels in MCS plasma. Additionally, elevated levels of NO2-/NO3-, H2O2 and low activity of catalase stimulate the expression and action of pro-inflammatory redox-dependent cytokines as the chemokines IL-8 and MCP-1 and the growth factors PDGF and VEGF. So there are abnormal levels of several immune-modulating cytokines in un-stimulated MCS individuals6, expecially for the ratio of IL-4/IL-13, that are Th2 associated cytokines. In particular, there is an important up-regulation of IL-4 and a down-regulation of IL-13 (An elevated pro-inflammatory cytokine profile in multiple chemical sensitivity, 2013). Cytokines enhance COX-2 and LOX genes expression, that rapidly oxidize products of PUFA peroxidation_ forming respectively prostaglandins and leukotrienes, that are potent biological effectors. In conclusion, in MCS un-stimulated people seems to be an elevated immune activation and chronic low-grade inflammation. It is important to take in consideration that there is no alteration in IgE plasma levels: the symptoms experienced after inhalation of common volatile chemicals are not mediated by enhanced IgE . Therefore there is an individual peculiarity of adaptive or not adaptative response to chemical stressors, so that an exposure to those products could exasperate a an already compromised condition. Exposure to chemical agents may induces a further increase of IL-4 plasma level due to IL-4 producing cells (as eosinophils or mast cells) in lungs and nasal lamina propria. For what concerns IL-13, it changes the mucosal epithelium of the respiratory trat from an absorptive barrier to a mucus secreting one by stimulating mucus production, and it is also involved in suppression of cytokines production. Because of the low level of IL-13 in MCS people, their mechanisms of protection may be less functional. This mechanism could (partially) explain the wide range of symptoms after exposure and also the high comorbidity with psychiatric disorders (From inflammation to sickness and depression, 2008). Because of the uncertain pathogenesis of MCS there is no a gold standard therapy and the only certain preventive measure is to avoid known irritants. Nonetheless several treatments have been proposed in order to relieve MCS symptoms such as psycotherapy (expecially mindfullness-based cognitive therapy), antidepressant (Zoloft, Sertraline), anxiolytics, nutritional support (vitamins), antioxidant etc. In relation to glutathione depletion, a recent study hypothesizes that intranasal administration7 of GSH could be a good solution. In fact, the patients who have been administrated inGSH has reported an improvement in MCS symptoms, probably because it can improve detoxification and lead to a decreasing ROS levels. Moreover, equally important, inGSH therapy is well tolerated, non-invasive, can be self-administered and is inexpensive (∼$50/month). Even though (in)GSH holds promise for future treatment of MCS an other respiratory and CNS diseases (where free-radical burden is a suspected contributor to disease progression) it should be further evaluated by clinical trials. Currently additional studies are certainly needed for a better understanding of Multiple Chemical Sensitivity, as well as other Environmental Illnesses. Meanwhile we can all contribute to improve our health and that of environment, for example using organic products rather than chemicals. 1 Some studies reported that most patients with MCS are women between the ages of 30 and 50 years (Multiple Chemical Sensitivity, 2012; Clinical features of multiple chemical sensitivity, 1997). 4 Also of several related conditions, including fibromyalgia, post-traumatic stress disorder, Gulf War syndrome, and chronic fatigue syndrome. 6 IL-1, IL-2, IL-4, IL-6 and TNFalfa found to be statistically significantly increased and IL-13 down-regulated. 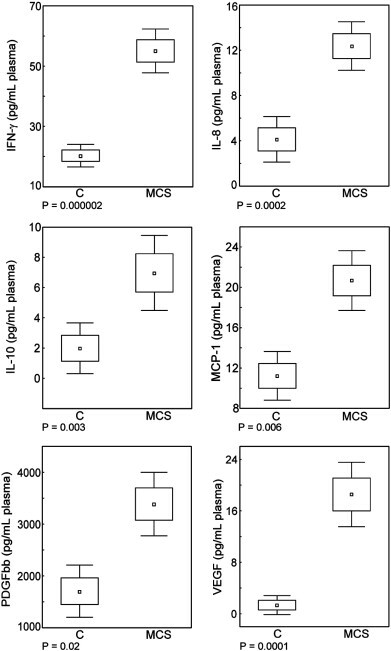 The cytokine differences in MCS seen in this study are in line with findings from other medically unexplained disorders often associated with MCS, such as FMS, CFS and GWS. 7 Because of the target tissue is the brain or the respiratory tract, the best method of administration is intranasal.